Converse shoes are always in trend. I love the cute and vibrant colour and designs those have. I have recently ordered one pair of converse shoes for myself.. I remember my brother had one pair of converse shoes in denim material and I used to wear that sometimes just to see how those looked on me..and he always scolded me to not to touch his stuffs without his permission.. That childhood days were awesome.. 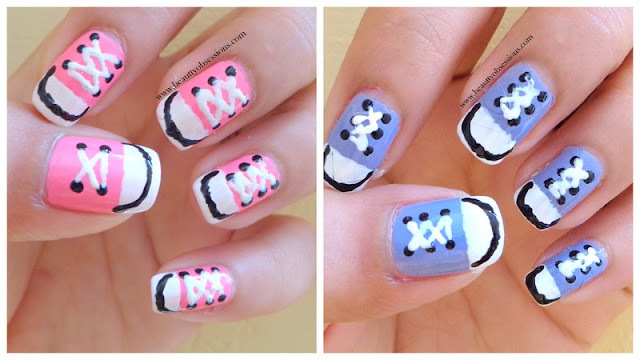 Anyway today I am going to share a really cute and very easy nailart inspired by Converse Shoes. I have drawn two arts here by taking different colours.. Actually I had drawn the lavender shade art first, but the shoe lace portion was not clear in that,it was looking fussy type.. Then I drew the pink one and it is very clear and neat..What u say ..?? Okk, here you need only three shades.. One white polish,one black polish and one bright shade nail polish to create the base colour , because the converse shoes are very colourful..
1- Fist paint your nails with a bright colour to create the base of the shoe. 2- Then paint 1/3rd of your nail with white nail paint . Now draw a curvy line by taking the black nail polish just to resemble the outer curvy part of the shoe. 3- Then put black dots in parallel way like in picture to resemble the lace holes. Make sure you have put the dots in a wide manner. 4- Now connect the holes with white lines in a zigzag manner which will resemble the shoe lace..
5- Apply a top coat to lock the art and... Done..
Hope you liked this simple yet cute nailart.. Do share your feedback below.. So much fun. I was a huge Converse fan when I was younger, too. Good Idea and simple too! It looks so cute. Never knew we can wear shoes on our nails too. Loved it. So cute, I loved the tutorial.